There won't be anyone saying they don't like these Brussels Sprouts! Bring a large pot of salted water to the boil. Add the Brussels sprouts and simmer for 5 minutes. 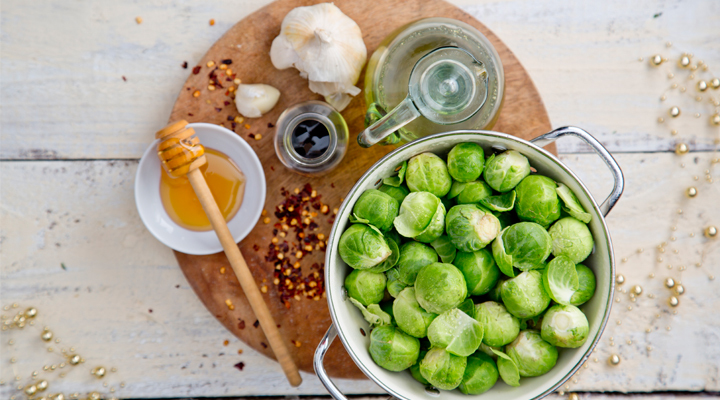 Using a slotted spoon, transfer the sprouts to a bowl of iced water to stop the cooking process. Put the teriyaki sauce, garlic, olive oil, honey and chilli flakes in a small bowl and combine thoroughly. Drain the sprouts and put in a large bowl, then pour half the teriyaki glaze over. Toss to combine, then transfer the sprouts to a non-stick baking tray. Roast in the oven for about 10 minutes, then transfer to a serving bowl and drizzle the remaining teriyaki glaze over. Shake the bowl to coat all the sprouts with the glaze and serve immediately.